As housing lawyers, we have daily contact with clients facing the threat – or reality – of homelessness and we do all we can using the power of the law to prevent our clients ending up on the streets. Sometimes the job has a glamour to it: like the thrill of sitting at a Court of Appeal or Supreme Court case, in which significant points of housing law are being thrashed out by some of the country’s finest legal minds. Or then there’s the urgency of a new client attending the day before his eviction date and the need for us to urgently negotiate with a landlord about suspending the warrant. But often the day job has a comfortable rhythm to it: letters to write; barristers to instruct; clients to reassure. There’s a comfort to sitting at my desk in an office during the day, and then heading home after work to a home-cooked meal and warm bed. And so from time to time it’s a good idea to get out of the comfort zone to see life, however briefly, from a different perspective. 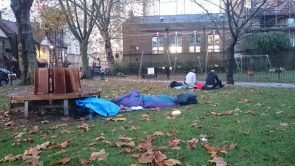 Last Saturday night I joined a dozen others sleeping out in a park near Waterloo, all being sponsored to raise funds for Webber Street Day Centre, a homeless shelter run by London City Mission. Webber Street is an impressive charity: for over fifty years the shelter has given friendship, support, food, and showers to some of London’s most needy individuals. It is an oasis of hope and grace in a city which can often, to those street homeless, feel utterly devoid of hope. The charity also runs Hope Community Homes, which is a stepping stone for those who have been homeless to transition into independent living with the experience of managing their own tenancy and holding down a job. Webber Street is also supported by the sandwich chain Pret a Manger, which provides not only sandwiches in abundance but offers workplace apprenticeships to the ex-homeless, with the intention of leading to full-time employment. This is holistic, integrated, long-sighted care for London’s homeless at its best – and so was a worthy cause for us seeking to raise sponsorship for a night out sleeping rough. Sleeping on bits of cardboard in mid-November in a central London park is quite something! I was surprised how noisy London can be at 4am on a Sunday morning: wailing police sirens; cats fighting; party-goers shouting; trees rustling. Thankfully there was no rain but there was a real chill in the air, especially with the gusts of wind blowing throughout the night. After perhaps a few hours broken sleep throughout the night, it was a treat to get back inside the Webber Street centre and warm up with a hot breakfast to debrief. A number of people commented on how vulnerable they felt all night – so much so they could not get a wink of sleep. Others shared how bitterly cold and uncomfortable they were. All of us were struck by the thought that whilst we could now head to our warm homes, no such luxury exists for London’s street homeless – they will face one night after the next on their cardboards beds. So it was a brief, if sheltered, insight into life sleeping rough and a reminder of how broken life can be and the answers are, in part, to be found in a united, holistic approach. Social services, mental health agencies, housing charities, employment support workers and so many others must be involved together – often even in the life of just one individual. That’s an ambitious holistic approach and London – let alone the UK – is a long way from where we need to be. But in the meantime homeless day centres like Webber Street offer a real place of hope. Give: A charity like Webber Street costs £1,200 per day to run. Our spare pounds can make a great difference! Go: Most homeless charities would love more volunteers. Our time and skills can be used for great good! Gossip. Simple word of mouth and signing petitions can be very effective in increasing awareness. Our words can have great power! You can support Ed by donating through his giving page.